Swahili is one of the most widely spoken languages in Africa. Although it is spoken as a first language by only about 2 million people (estimates vary widely), mostly along the coast of Kenya and Tanzania, it is a second language for the great majority of people in East Africa. It is an official language in Kenya, Tanzania, and Uganda, and is also very widely spoken in the eastern Congo. 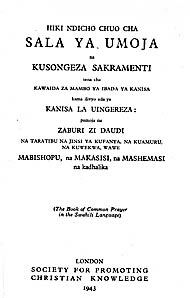 The Book of Common Prayer was first translated into Swahili in 1876, and has seen well over a dozen editions and printings down to the present day. The British, who ruled most all of East Africa following WW I, encouraged the use of Swahili as a way to unify their colonies and thus help facilitate their rule over them. Thus it became a lingua franca for much of East Africa. The Book of Common Prayer has been printed in the two major dialects of Swahili, the Kiunjuga, or Southern, or Zanzibar dialect, and the Kimvita, or Central, or Mombasa dialect. Since 1935 it has also been printed in Standardized Swahili. All of these are fairly similar and mutually intelligible. This present text is a translation of nearly the entire 1662 BCP, with some additions. It is in the Kimvita dialect, which is spoken primarily on the Kenyan coast, and is listed in David Griffiths' Bibliography of the Book of Common Prayer as 165:4. It was translated by CMS missionaries in the Mombasa Diocese and published in 1943. As I do not know Swahili, the English translations of titles of the Services below, and of the various subsections within them, particularly for those parts not found in the 1662 BCP, were arrived at by use of a Swahili-English dictionary. The text has been spell-checked, but some errors likely still remain. Any corrections and/or clarifications would be welcome. Besides the HTML files below, we also have the entire book available as PDF graphics. It includes extractable text, but this text has not been checked and undoubtedly contains errors. See link at right. 27. Taratibu ya Kuwatia Wasikizi Katiki Kundi la Watafiti.